Let There Be Bling! 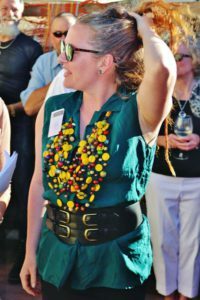 combines the stunning work of ten local jewellery designers with a delicious Kangaroo Island Spirits cocktail experience. The perfect way to start your festive season celebrations. L – R: Red Lucky Drop $250, green $89, Gold/red Squink cuff $55, Vintage fabric bangle $35, long hook earrings $49. December is celebration month at Fine Art Kangaroo Island and the first of the month begins a very special tenth-anniversary celebration at the much-loved Kingscote gallery. Let There Be Bling! – Fine Art Kangaroo Island’s tenth jewellery cocktail party features ten of South Australia’s most talented jewellery designers – all with deep connections to Kangaroo Island. Local silversmith Fred Peters and nine other island jewellers are set to celebrate more than a few milestones at the official opening of the exhibition on Friday, December 1st. With the tenth anniversary of founding the gallery fast approaching, Fleur and Fred Peters will set the festive mood by hosting this highly anticipated annual jewellery showcase, featuring local models who mingle with guests at the event. Now a fashion tradition on Kangaroo Island, all the pre-opening buzz will be around the models’ choices in coordinating wearable art jewellery to match their party outfits. Time and Tide by Fred Peters is the “Fashion Flair” competition prize in 2017. For those who take pride in demonstrating a little fashion flair, there is an opportunity to win the beautiful Fred Peters pendant Time and Tide, with unseen judges moving among the crowd to choose the best-coordinated jewellery and outfit of the night. 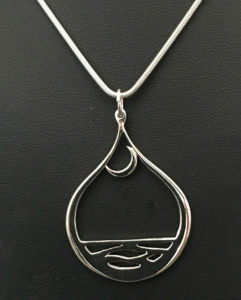 Everyone attending the event will be eligible to win this eye-catching sterling silver piece, first released at this year’s National Wine Centre exhibition. To win, make your fashion statement unforgettable by perfectly coordinating your jewellery and outfit for the occasion. Our silent judges will be on the lookout for the best-coordinated look, and the winner of the pendant will be announced toward the end of the evening. Winners of the Fashion Flair award in past years have ranged from the purely breathtaking to the quietly understated, but all have one thing in common – clothing and jewellery cleverly combined to create a look that emphasises and enhances the artistic vision of the designer. Jewellery model Serena Carney coordinated the perfect outfit to set off this eye-catching beaded statement piece for the win in 2015. Jewellery model Serena Carney got it right in 2015, creating an unforgettable impression when she combined this breathtaking Patsy Verwaal wooden beaded assemblage with a carefully chosen outfit in shimmering deep green and black. Following the successful recipe of previous years, Let There Be Bling! will also feature the cocktail mastery of our favourite local mixologists. 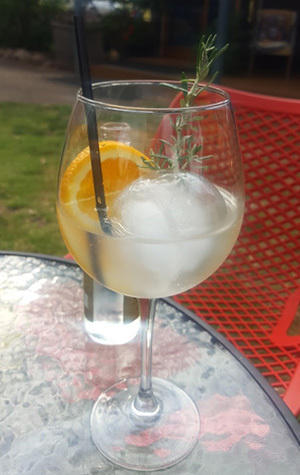 Experts from the Award-winning Kangaroo Island Spirits will offer cocktail tastings at 5:15 pm, then operate a cocktail bar showcasing their handcrafted spirits through the remainder of the evening. 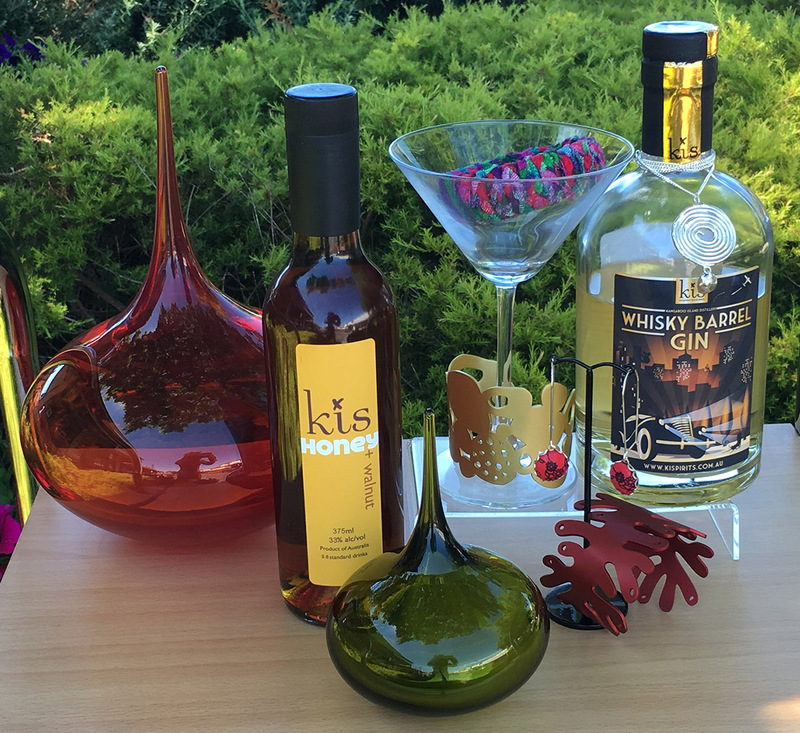 With Kangaroo Island Spirits (KIS) gins, vodkas and specialty liqueurs having won some three dozen medals at competitions across the globe, you know you’ll be sampling the very best with every KIS cocktail on offer. paraded informally around you while you enjoy the beautiful artwork displays throughout the gallery and garden. For ten years, Fred and Fleur Peters have built their business on one unwavering principle – Kangaroo Island’s artists have an affinity for this place which inspires artworks of the highest quality, and speaks to art lovers everywhere. The island has drawn many of South Australia’s most talented jewellery designers to its shores, and ten of them are featured in Let There Be Bling! This year’s lineup includes returning artists Audrey Harnett, Anne Morrison, Bea Chuan, Cecilia Gunnarsson, Lilly Griffith, Patsy Verwaal, Peggy Rismiller and Patti Blucher and of course gallery owner Fred Peters. 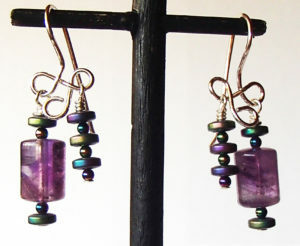 Metal, precious metal such as sterling silver, gemstones, semi-precious gemstones, vintage fabric, glass, and found and upcycled materials are lovingly and passionately crafted into memorable and, soon-to-be favourite pieces of jewellery. Patti Blucher is hard at work assembling her once a year release of Random Gathering Beads. Always colourful and highly sought after, each of these long or short necklaces are crafted from a seemingly endless selection of gifts from Patti’s friends. You’ll be fascinated to see the results as Patti weaves her magic, reimagining each with the addition of special pieces and shells woven together on fisherman’s braid. There will also be a new collection of Patti’s “Tidal Wanderings” sterling silver ensemble necklaces, previously unseen on Kangaroo Island. Lovers of Fred Peters’ island-inspired sterling silver jewellery are in for a treat as well. Let There Be Bling! will feature several pieces now available in our exciting online store. Also on show will be some of Fred’s most recent work from this year’s exhibition at the National Wine Centre. These newest pendants and earrings from Fred are proving very popular, with designs reflecting the intertidal theme attracting special attention from visitors to the gallery. 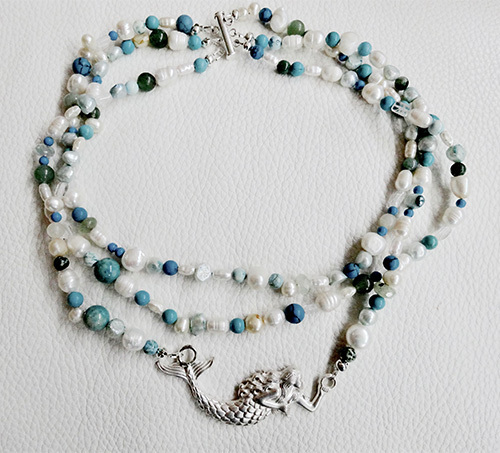 Peggy Rismiller travels extensively and has a lifetime collection of semiprecious stones gathered while wandering the globe. Peggy takes inspiration from the simplicity and elegance of ancient jewellery, drawing on her natural island surroundings for every creation and is renowned for designing striking pieces featuring unusual clasps and findings. Peggy’s jewellery is always highly decorative and offers great versatility for the wearer, many of her necklaces designed so the same piece can be worn in a number of ways. Cecilia Gunnarsson’s Squink range has been in high demand since first appearing at Fine Art Kangaroo Island. With new stocks arriving in time for the exhibition, summer partying is sure to be filled with colour and excitement. 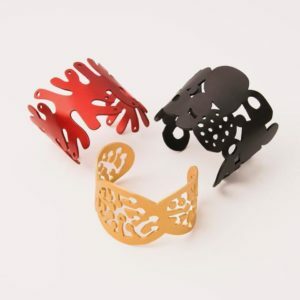 Squink bracelets, earrings and necklaces are available in a range of colours and designs, each inspired by natural elements found on Kangaroo Island. The range also includes colourful household items including salad servers and trivets to brighten the festive season. 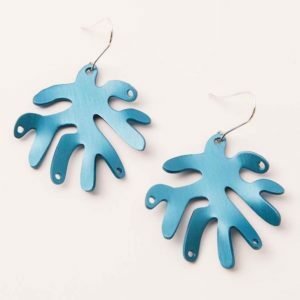 Blue seaweed earrings $45 by Squink. If you’ve decided jewellery is the perfect gift for someone special in your life, Let There Be Bling! provides the perfect setting for choosing exactly the right piece. Bring that special person to the exhibition and see which of the jewellery pieces worn by our live models attracts their attention. Once you’ve identified your purchase, just let our gallery staff know and we’ll arrange to hold it for collection next day. With cocktails and hors-d’oeuvres on offer, other jewellery lovers to chat with, and a festive party atmosphere, we’ll provide the perfect smoke-screen so you can maintain that all important gift-giving element of surprise. We are delighted to have experienced speaker, communicator, life coach, and local personality Jeanette Gellard officially open the exhibition in the main gallery at six o’çlock. 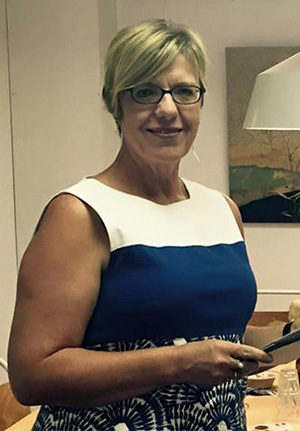 Jeanette has been a friend of the gallery throughout its decade-long history. Fred and Fleur are excited to welcome everyone to Let There Be Bling! Whether you’re already deep into your festive season celebrations, or looking forward to your first festive party for 2017, it’s a great chance to catch up with old friends and make some new ones. Start planning the perfect outfit, dust off your favourite jewellery or contact Fleur at the gallery to be matched to a jeweller and become a jewellery model. Men, women and children are all welcome to participate as models, so come help us bring the bling!